The best part of household moves: dealing with utility services. “Corinne” hung up on me without answering my question. Oh, the arrogance of virtual hegemony. I can’t order cable until the previous owners cancel. I can’t even order broadband until they’ve done our cable installation (even though Comcast clearly has drops in the house!). O.k., so we’ll play a lot of Trivial Pursuit and listen to NPR. For Internet access, beyond working out of Starbucks and Borders (MPOW has a TMobile account for just these situations), who has bright ideas for short-term dialup access? This was written by K.G. Schneider. Posted on Saturday, August 19, 2006, at 10:08 am. Filed under Uncategorized. Bookmark the permalink. Follow comments here with the RSS feed. Both comments and trackbacks are currently closed. When I was living in Milwaukee, I decided to drop Earthlink as my ISP and found a local ISP that offered cheap dial-up and friendly, “I’m talking to a real person” service. So, if there’s something like that in Florida, that might work for you. I did a search and found this page with some local Tallahassee ISPs. A lot of McDonalds have wireless. Costs about $3/2 hours. Don’t sit near the loo (traffic). 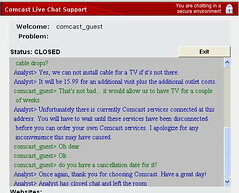 Comcast-it’s great when you have it installed but it’s hell when you have to deal with their customer service at all. Do your new neighbors have open wifi? We have a mutual aid agreement with some of our neighbors. If our net is down, we can use theirs. All of the branches of the Leon County Library System have wireless access and there is the Digital Canopy in the downtown area. These are free. Well, but. I can’t separate my job tasks; they’re interrelated. I’d be better off in a business center where I could simultaneously work online, talk on the phone, instant message, fax, juggle print jobs, write, etc. It’s a networked job. Dialup would work ok, however. Well, I was going to suggest looking up a local FreeNEt, but apparently the Tallahassee FreeNet – http://www.tfn.net – is having trouble with their dial-up. Karen, I feel your pain. When I moved to Houston a year ago it took me over a month to get Internet setup from Time Warner. No amount of begging, pleading and offering to set the darn thing up myself (ie go get stupid cable modem box and plug in) moved things along. When they came and it took then less than 15 minutes to get it to work, I was fuming. Just one of those joys of moving! I hear rumors that Time Warner is leaving this area and Comcast is taking over? so maybe I’ll have a similar joyous customer service interaction in the near future. I get almost free ($10/six months) dial-up access to my ISP through the university. My father also uses dial-up to AOL. For just email and browsing the web it is sufficient.